Larry Lokai was honored at the Hardin County Poultry Awards Banquet. Larry Lokai of Urbana was honored at the third annual Hardin County Poultry Awards Banquet. Each year an honoree is selected for service and dedication that helped the junior fair poultry exhibitors of Hardin County. Lokai was the guest speaker at the banquet and later was presented a plaque naming him the Hardin County Poultry Honoree. For the past 51 years Lokai has been involved with poultry judging at county junior fair shows. He has judged fairs more than a dozen years in the last three decades in Hardin County. He has judged in 83 Ohio counties and has judged 97 shows in California, Indiana, Kentucky, Michigan Ohio and Pennsylvania. He coached The Ohio State University Poultry Judging Team 1998-2001. During his 4-H and FFA coaching career he coached 27 Ohio Poultry Judging teams, including the 2013 West Liberty-Salem FFA State Champions. Since 1983 he had served as an official judge and committee member of the National FFA Poultry Career Development Committee. 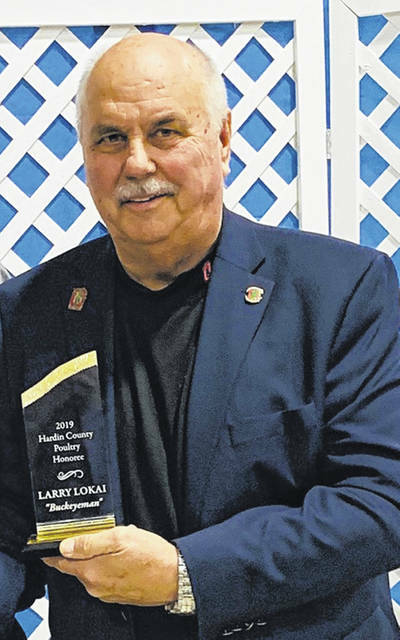 https://www.urbanacitizen.com/wp-content/uploads/sites/36/2019/03/web1_Larry.jpgLarry Lokai was honored at the Hardin County Poultry Awards Banquet.